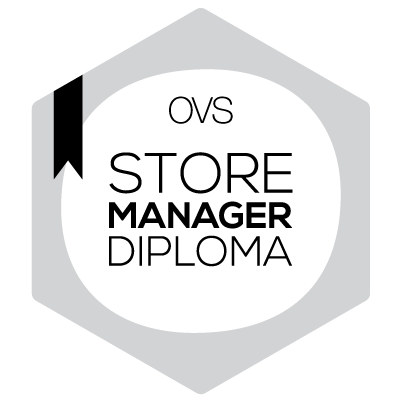 More than 1 year ago, 20 newly graduated young men and women passed the OVS selection test and were taken on as Trainee Store Managers, thus setting out on a training pathway that led to them obtaining, on Thursday 21st September 2017 the Diploma of Store Manager, as from this year also in the form of an Open Badge. A complex activity, composed of various competencies, such as that of the store manager, can only be trained on the job, while facing issues, observing colleagues, taking all the steps leading to mastering the management of the work, including making choices about visual merchandising, administrative aspects, knowing the product and so on. But on the job training does not mean ignoring a structured pathway, one that takes care of covering all the topics required and accompanies the candidates in constructing their professional figure and that provides them with all the useful tools, not least the company’s will to invest in people and get out there with them. The youngsters are aware of this and are applying in droves for this type of pathway, something that OVS is also well aware of, taking on around 150 Trainee Store Managers a year, including the 20 who collected their Diploma Thursday 21 September, and guiding them along a pathway lasting from 15 to 20 months and terminating in the award of the Store Manager Diploma. "It was a pathway that made us grow professionally and personally; all that commitment and effort led to an incredible amount of satisfaction. I would start all over again! (Francesco, 28 years old)"
The training pathway perfected by the OVS Store Management School places great importance on learning by doing, which represents 70% of the training, while 20% is made up of learning from others and only 10% by formal study, which is functional in building the theoretical basis underpinning the training experience. Study, practice, receive feedback and learn: this is the learning scheme that guides the learners in OVS. To add value to the competencies developed and proven during the pathway, OVS has decided, as from this year, to issue its learners with the diploma in the form of an Open Badge through Bestr.